The recent investment arbitral decision on the Baagerwerken Decloedt En Zoon (BDZ) versus the Philippines case in favor of the Belgian corporation should be a wake up call to the Duterte administration on the dangers posed by free trade and investment agreements to our national interest. The investment arbitration case filed in 2011 in the World Bank’s International Centre for the Settlement of Investment Disputes (ICSID) stem from the decision of former President Benigno Aquino III to cancel a contract entered into by the Macapal-Arroyo government to dredge Laguna de Bay as part of its river rehabilitation program. The Aquino government justified the cancellation on the grounds that the contract was tainted with corruption and that the terms were unfavorable to the government, While it is debatable whether or not Aquino’s actions were based on sound judgment or purely political in nature as some have opined, what is clear is that government actions, in this case the decision to terminate a contract, are open to legal challenges from corporations that could cost billions of taxpayers money. The right of corporations to sue governments is enshrined and guaranteed in bilateral investment treaties, and new generation free trade agreements under the investor state dispute settlement mechanism or ISDS. By signing on to these agreements, our government is giving consent to these corporations to hail us to court and demand compensation for actions, policies, regulations that will be deemed detrimental to the corporate interest. The actual amount of the award to BDZ has not yet been published as the tribunal awaits the consent from the parties, although there are reports that it can be in the range of US $800 million to US$4 billion that the corporation is demanding. The actual cost to the Philippines though will definitely be much more than this if you factor in the cost incurred in litigating the case. To argue and defend our case, the Philippine government got the legal services of the American law firm White and Case based in Washington, DC, the same firm that represented us in the Fraport case. It has been reported that the cost of litigating that case amounted to as much as US$ 58 million. This ISDS system is clearly biased in favor of corporations. According to UNCTAD’s World Investment Report 2015, investors have won 60% of the decisions on the merits and 72% of the decisions on jurisdiction. And, these numbers do not even take into account the cases that are settled. Those should also be counted as a win for the investor since most of the time they involve a monetary compensation or a change in the legislation/regulation that triggered the case. Since only investors can initiate these lawsuits, States never win; they may – at best - not lose a case. In the wake of the ICSID award in favor of BDZ, the Duterte government should initiate a serious process of reviewing all the bilateral investment treaties and free trade agreements that previous governments have entered into, with the view to terminate agreements that are clearly detrimental to our national interest. 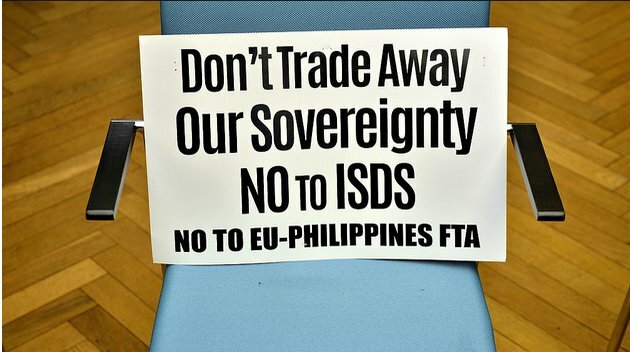 It should also stop on- going negotiations for new generation free trade agreements like the Regional Comprehensive Economic Partnership Agreement (RCEP) and the EU-Philippines FTA where ISDS provisions are being pushed. Only then can we ensure that the governments right to regulate investments in the name of public interest can be protected.